The rough industrial space under the arches of Ventura Centrale forms the backdrop for All New. This year Lensvelt will exhibit a spectacular installation during Milan Design Week, together wit Modular Lighting and JPS architects. On show: a mix of both new products and extensions to existing collections and classics, in collaboration with internationally renowned designers, architects and artists. Now in the spotlights: the new Fold chair in collaboration with Studio Piet Boon, Table Five by architect Luc Binst / B brand, the Lazy Modernist and the Office Chair by Atelier Van Lieshout, and the S88, an armchair by Maarten Van Severen. 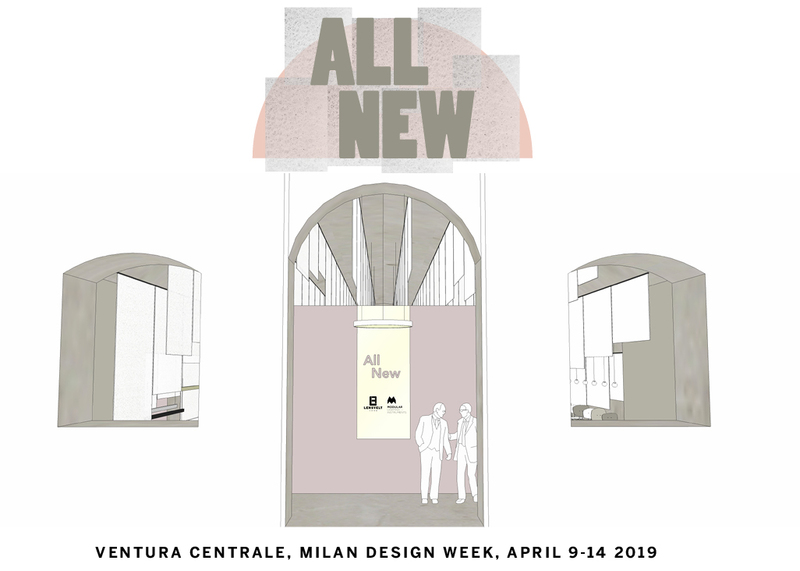 All New is a nod to last year when Lensvelt presented Nothing New in Milan as a sustainable statement against all the abundance of design. This year is a lot new. In the remarkable presentation, Lensvelt shows furniture – often with a twist- that is accessible, affordable and applicable for everyone.The collaboration with Studio Piet Boon, for example, resulted in a particularly innovative and elegant chair: Fold. Lensvelt and Studio Piet Boon, a renowned, internationally operating design company, find each other in a common interest in innovative, functional, timeless, aesthetic, and comfortable designs. A great love for rich, natural, sustainable materials, typical shapes and an eye for special details can be found in Fold. The chair was not created from a sketch, but from making, by using the moulage technique from the fashion industry to fold the fabric around the shell. The pockets that are created are filled with foam; it makes Fold a comfortable, graceful chair on refined, light steel legs. Together with Luc Binst, Five is presented: the table with the five legs. It is the first product of design studio B brand that Luc Binst of the Flemish architecture firm Binst Architects recently launched. The atypical and smart table concept resembles a construction set that offers the freedom to make various arrangements. The five legs can be mounted in different places under the table, depending on the function and the number of users. It provides optimum legroom and you don’t always have to sit opposite each other.The tabletop has been specially developed for Five. Made from a high-tech HPL that is aesthetic, durable and innovative due to the soft texture. The surface is finished in a matte color, the edges in an identical but high gloss color. Five has no tabletop frame which gives the table an architectural look. And Five is easy to assemble and dismantle. 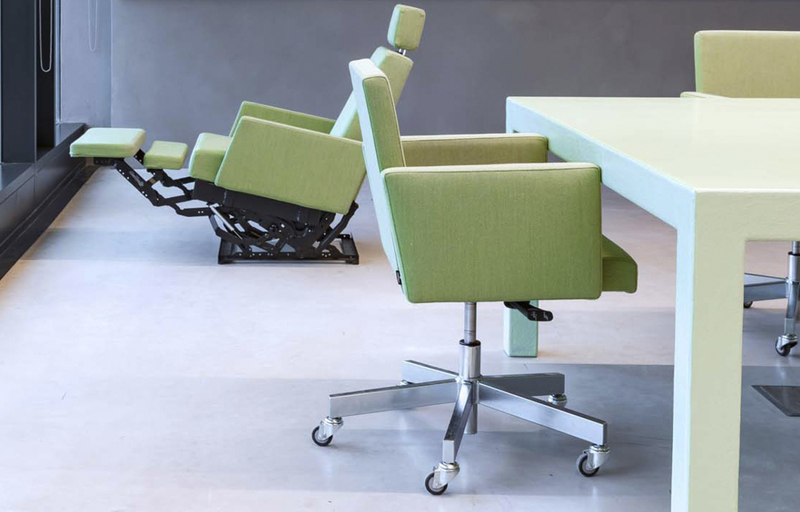 Meet the minimalist, high-quality, comfortable AVL Office Chair by Atelier van Lieshout (AVL). A tough office chair with a twist that AVL and Lensvelt produced together because the available office chairs were, according to Joep van Lieshout, overdesigned and looked like hair dryers and vacuum cleaners. The AVL Office Chair is one of Lensvelts bestsellers, because it fits in any office, meeting room, reception or workplace. The famous armchair can be found in the VIP Lounge at Schiphol Airport, and was present at the Nuclear Security Summit in The Hague in 2014 and even former President Barak Obama, and all other world leaders sat on an AVL Office Chairs during the Eurotop in Amsterdam in 2016.Lensvelt also presents the ultimate AVL relax chair to the international audience: the Lazy Modernist. The characterful chair can be adjusted to the shape of everyone’s body, both in the sitting and lying position. The backrest, headrest and footrest are also adjustable. 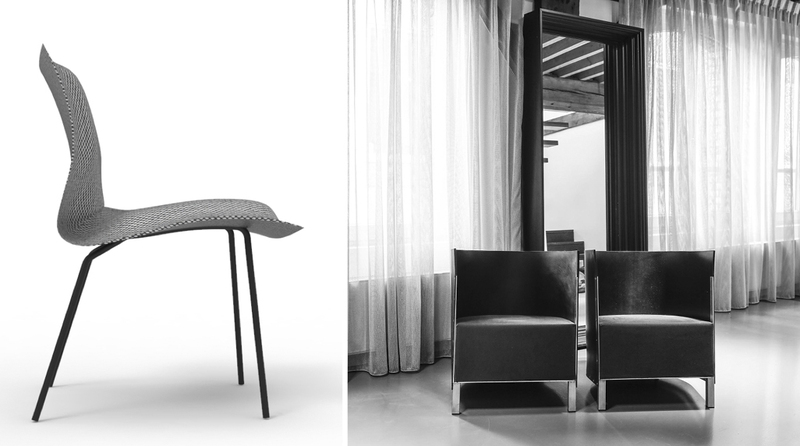 One of the most remarkable classics cannot be missed in this Milanese show: the S88 armchair by Maarten Van Severen. Lensvelt produces a substantial part of the collection of the renowned Flemish designer who died in 2005, including this S88. Made from three materials: steel leather and canvas. The soft leather of the round backrest fits smoothly around you like a comfortable blanket. None of the furniture in the All New presentation are works of art for the happy few, but accessible products for an international audience, foreign distributors, architects and interior architects.